Special purpose fasteners are designed for applications in which fastener strength, ease of installation, or temperature properties of the fastener require consideration. Solid shank rivets have been the preferred construction method for metal aircraft for many years because they fill up the hole, which results in good load transfer, but they are not always ideal. For example, the attachment of many nonstructural parts (aircraft interior furnishings, flooring, deicing boots, etc.) do not need the full strength of solid shank rivets. To install solid shank rivets, the aircraft technician must have access to both sides of a riveted structure or structural part. There are many places on an aircraft where this access is impossible or where limited space does not permit the use of a bucking bar. In these instances, it is not possible to use solid shank rivets, and special fasteners have been designed that can be bucked from the front. [Figure 1] There are also areas of high loads, high fatigue, and bending on aircraft. Although the shear loads of riveted joints are very good, the tension, or clamp-up, loads are less than ideal. Special purpose fasteners are sometimes lighter than solid shank rivets, yet strong enough for their intended use. These fasteners are manufactured by several corporations and have unique characteristics that require special installation tools, special installation procedures, and special removal procedures. Because these fasteners are often inserted in locations where one head, usually the shop head, cannot be seen, they are called blind rivets or blind fasteners. On aircraft in air intake areas where rivet parts may be ingested by the engine. On aircraft control surfaces, hinges, hinge brackets, flight control actuating systems, wing attachment fittings, landing gear fittings, on floats or amphibian hulls below the water level, or other heavily stressed locations on the aircraft. The first blind fasteners were introduced in 1940 by the Cherry Rivet Company (now Cherry® Aerospace), and the aviation industry quickly adopted them. The past decades have seen a proliferation of blind fastening systems based on the original concept, which consists of a tubular rivet with a fixed head and a hollow sleeve. Inserted within the rivet’s core is a stem that is enlarged or serrated on its exposed end when activated by a pulling-type rivet gun. The lower end of the stem extends beyond the inner sheet of metal. This portion contains a tapered joining portion and a blind head that has a larger diameter than the stem or the sleeve of the tubular rivet. When the pulling force of the rivet gun forces the blind head upward into the sleeve, its stem upsets or expands the lower end of the sleeve into a tail. This presses the inner sheet upward and closes any space that might have existed between it and the outer sheet. Since the exposed head of the rivet is held tightly against the outer sheet by the rivet gun, the sheets of metal are clamped, or clinched, together. 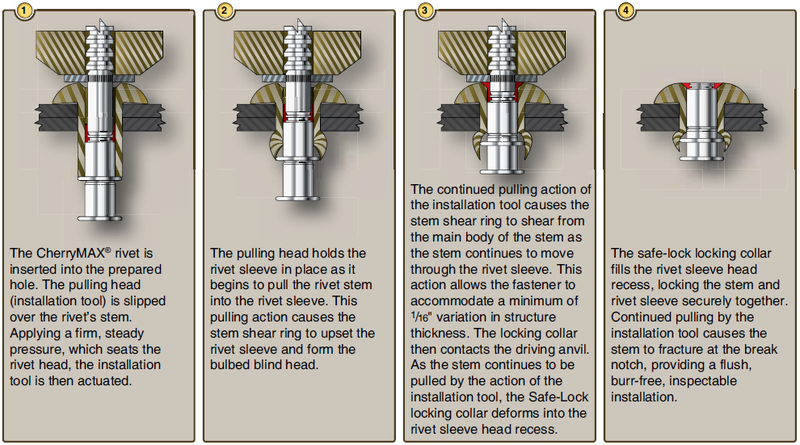 NOTE: Fastener manufacturers use different terminology to describe the parts of the blind rivet. The terms “mandrel,” “spindle,” and “stem” are often used interchangeably. For clarity, the word “stem” is used in this site and refers to the piece that is inserted into the hollow sleeve. Standard self-plugging blind rivets consist of a hollow sleeve and a stem with increased diameter in the plug section. The blind head is formed as the stem is pulled into the sleeve. 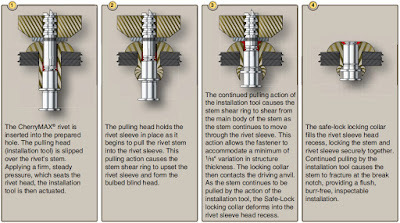 Friction-locked blind rivets have a multiple-piece construction and rely on friction to lock the stem to the sleeve. As the stem is drawn up into the rivet shank, the stem portion upsets the shank on the blind side, forming a plug in the hollow center of the rivet. The excess portion of the stem breaks off at a groove due to the continued pulling action of the rivet gun. Metals used for these rivets are 2117-T4 and 5056-F aluminum alloy. Monel® is used for special applications. Friction-lock blind rivets are less expensive than mechanicallock blind rivets and are sometimes used for nonstructural applications. Inspection of friction-lock blind rivets is visual. A more detailed discussion on how to inspect riveted joints can be found in the section, General Repair Practices. Removal of friction-lock blind rivets consists of punching out the friction-lock stem and then treating it like any other rivet. The self-plugging, mechanical-lock blind rivet was developed to prevent the problem of losing the center stem due to vibration. This rivet has a device on the puller or rivet head that locks the center stem into place when installed. Bulbed, self-plugging, mechanically-locked blind rivets form a large, blind head that provides higher strength in thin sheets when installed. They may be used in applications where the blind head is formed against a dimpled sheet. Manufacturers such as Cherry® Aerospace (CherryMAX®, CherryLOCK®, Cherry SST®) and Alcoa Fastening Systems (Huck-Clinch®, HuckMax®, Unimatic®) make many variations of this of blind rivet. While similar in design, the tooling for these rivets is often not interchangeable. A fully serrated stem with break notch, shear ring, and integral grip adjustment cone. A driving anvil to ensure a visible mechanical lock with each fastener installation. A separate, visible, and inspectable locking collar that mechanically locks the stem to the rivet sleeve. A rivet sleeve with recess in the head to receive the locking collar. It is called a bulbed fastener due to its large blind side bearing surface, developed during the installation process. These rivets are used in thin sheet applications and for use in materials that may be damaged by other types of blind rivets. This rivet features a safe-lock locking collar for more reliable joint integrity. The rough end of the retained stem in the center on the manufactured head must never be filed smooth because it weakens the strength of the lockring, and the center stem could fall out. CherryMAX® bulbed rivets are available in three head styles: universal, 100° countersunk, and 100° reduced shear head styles. Their lengths are measured in increments of 1⁄16 inch. It is important to select a rivet with a length related to the grip length of the metal being joined. This blind rivet can be installed using either the Cherry® G750A or the newly released Cherry® G800 hand riveters, or either the pneumatichydraulic G704B or G747 CherryMAX® power tools. For installation, please refer to Figure 3. The CherryMAX® mechanical-lock blind rivet is popular with general aviation repair shops because it features the one tool concept to install three standard rivet diameters and their oversize counterparts. [Figure 4] CherryMAX® rivets are available in four nominal diameters: 1⁄8, 5⁄32, 3⁄16, and 1⁄4-inch and three oversized diameters and four head styles:universal, 100° flush head, 120° flush head, and NAS1097 flush head. This rivet consists of a blind header, hollow rivet shell, locking (foil) collar, driving anvil, and pulling stem complete with wrapped locking collar. The rivet sleeve and the driving washer blind bulbed header takes up the extended shank and forms the bucktail. 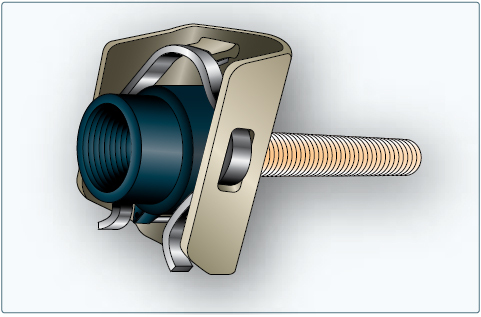 The stem and rivet sleeve work as an assembly to provide radial expansion and a large bearing footprint on the blind side of the fastened surface. The lock collar ensures that the stem and sleeve remain assembled during joint loading and unloading. Rivet sleeves are made from 5056 aluminum, Monel® and INCO 600. The stems are made from alloy steel, CRES, and INCO® X-750. CherryMAX® rivets have an ultimate shear strength ranging from 50 KSI to 75 KSI. Mechanically locked blind rivets are a challenge to remove because they are made from strong, hard metals. Lack of access poses yet another problem for the aviation technician. Designed for and used in difficult to reach locations means there is often no access to the blind side of the rivet or any way to provide support for the sheet metal surrounding the rivet’s location when the aviation technician attempts removal. The stem is mechanically locked by a small lock ring that needs to be removed first. Use a small center drill to provide a guide for a larger drill on top of the rivet stem and drill away the upper portion of the stem to destroy the lock. Try to remove the lock ring or use a prick punch or center punch to drive the stem down a little and remove the lock ring. After the lock ring is removed, the stem can be driven out with a drive punch. After the stem is removed, the rivet can be drilled out in the same way as a solid rivet. If possible, support the back side of the rivet with a backup block to prevent damage to the aircraft skin. 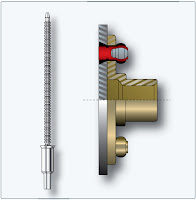 A pin fastening system, or high-shear pin rivet, is a two-piece fastener that consists of a threaded pin and a collar. The metal collar is swaged onto the grooved end, effecting a firm tight fit. They are essentially threadless bolts. High-shear rivets are installed with standard bucking bars and pneumatic riveting hammers. They require the use of a special gun set that incorporates collar swaging and trimming and a discharge port through which excess collar material is discharged. A separate size set is required for each shank diameter. Insert the rivet in the hole. Place a bucking bar against the rivet head. Slip the collar over the protruding rivet end. Place previously selected rivet set and gun over the collar. Align the gun until it is perpendicular to the material. 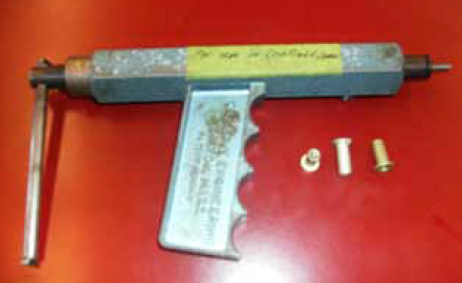 Depress the trigger on the gun, applying pressure to the rivet collar. This action causes the rivet collar to swage into the groove on the rivet end. Continue the driving action until the collar is properly formed and excess collar material is trimmed off. Slip the collar over the protruding end of rivet. Insert the correct size gun rivet set in a bucking bar and place the set against the collar of the rivet. Apply pressure against the rivet head with a flush rivet set and pneumatic riveting hammer. Continue applying pressure until the collar is formed in the groove and excess collar material is trimmed off. Pin rivets should be inspected on both sides of the material. The head of the rivet should not be marred and should fit tightly against the material. Grind a chisel edge on a small pin punch to a blade width of 1⁄8-inch. Place this tool at right angles to the collar and drive with a hammer to split the collar down one side. Repeat the operation on the opposite side. Then, with the chisel blade, pry the collar from the rivet. Tap the rivet out of the hole. Use a special hollow punch having one or more blades placed to split the collar. Pry the collar from the groove and tap out the rivet. Sharpen the cutting blades of a pair of nippers. Cut the collar in two pieces or use nippers at right angles to the rivet and cut through the small neck. A hollow-mill collar cutter can be used in a power hand drill to cut away enough collar material to permit the rivet to be tapped out of the work. The high-shear pin rivet family includes fasteners, such as the Hi-Lok®, Hi-Tigue®, and Hi-Lite® made by Hi-Shear Corporation and the CherryBUCK® 95 KSI One-Piece Shear Pin and Cherry E-Z Buck® Shear Pin made by Cherry® Aerospace. The threaded end of the Hi-Lok® two-piece fastener contains a hexagonal shaped recess. [Figure 5] The hex tip of an Allen wrench engages the recess to prevent rotation of the pin while the collar is being installed. The pin is designed in two basic head styles. For shear applications, the pin is made in countersunk style and in a compact protruding head style. For tension applications, the MS24694 countersunk and regular protruding head styles are available. The self-locking, threaded Hi-Lok® collar has an internal counterbore at the base to accommodate variations in material thickness. 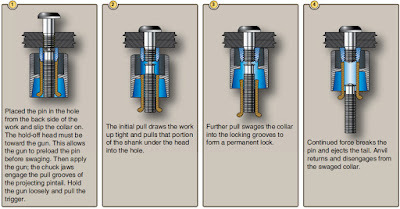 At the opposite end of the collar is a wrenching device that is torqued by the driving tool until it shears off during installation, leaving the lower portion of the collar seated with the proper torque without additional torque inspection. This shear-off point occurs when a predetermined preload or clamp-up is attained in the fastener during installation. The advantages of Hi-Lok® two-piece fastener include its light weight, high fatigue resistance, high strength, and its inability to be overtorqued. The pins, made from alloy steel, corrosion resistant steel, or titanium alloy, come in many standard and oversized shank diameters. The collars are made of aluminum alloy, corrosion resistant steel, or alloy steel. The collars have wrenching flats, fracture point, threads, and a recess. The wrenching flats are used to install the collar. The fracture point has been designed to allow the wrenching flats to shear when the proper torque has been reached. The threads match the threads of the pins and have been formed into an ellipse that is distorted to provide the locking action. The recess serves as a built-in washer. This area contains a portion of the shank and the transition area of the fastener. The hole shall be prepared so that the maximum interference fit does not exceed 0.002-inch. This avoids build up of excessive internal stresses in the work adjacent to the hole. The Hi-Lok® pin has a slight radius under its head to increase fatigue life. After drilling, deburr the edge of the hole to allow the head to seat fully in the hole. The Hi-Lok® is installed in interference fit holes for aluminum structure and a clearance fit for steel, titanium, and composite materials. The Hi-Tigue® fastener offers all of the benefits of the Hi-Lok® fastening system along with a unique bead design that enhances the fatigue performance of the structure making it ideal for situations that require a controlled interference fit. The Hi-Tigue® fastener assembly consists of a pin and collar. These pin rivets have a radius at the transition area. During installation in an interference fit hole, the radius area will “cold work” the hole. These fastening systems can be easily confused, and visual reference should not be used for identification. 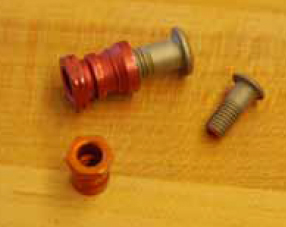 Use part numbers to identify these fasteners. The Hi-Lite® fastener is similar in design and principle to the Hi-Lok® fastener, but the Hi-Lite® fastener has a shorter transition area between the shank and the first load-bearing thread. Hi-Lite® has approximately one less thread. All Hi-Lite® fasteners are made of titanium. These differences reduce the weight of the Hi-Lite® fastener without lessening the shear strength, but the Hi-Lite® clamping forces are less than that of a Hi-Lok® fastener. The Hi-Lite® collars are also different and thus are not interchangeable with Hi-Lok® collars. Hi-Lite® fasteners can be replaced with Hi-Lok® fasteners for most applications, but Hi-Loks® cannot be replaced with Hi-Lites®. The CherryBUCK® is a bimetallic, one-piece fastener that combines a 95 KSI shear strength shank with a ductile, titanium-columbium tail. Theses fasteners are functionally interchangeable with comparable 6AI-4V titanium alloy two-piece shear fasteners, but with a number of advantages. Their one piece design means no foreign object damage (FOD), it has a 600 °F allowable temperature, and a very low backside profile. Also pioneered in the 1940s, the lockbolt is a two-piece fastener that combines the features of a high strength bolt and a rivet with advantages over each. [Figure 6] In general, a lockbolt is a nonexpanding fastener that has either a collar swaged into annular locking groves on the pin shank or a type of threaded collar to lock it in place. Available with either countersunk or protruding heads, lockbolts are permanent type fasteners assemblies and consist of a pin and a collar. 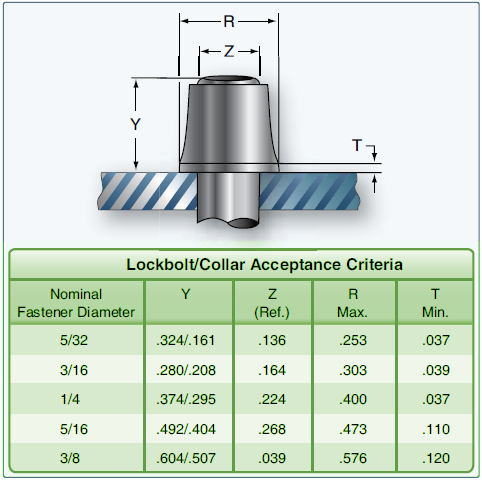 A lockbolt is similar to an ordinary rivet in that the locking collar, or nut, is weak in tension and it is difficult to remove once installed. Some of the lockbolts are similar to blind rivets and can be completely installed from one side. Others are fed into the workpiece with the manufactured head on the far side. The installation is completed on the near side with a gun similar to blind rivet gun. The lockbolt is easier and more quickly installed than the conventional rivet or bolt and eliminates the use of lockwashers, cotter pins, and special nuts. The lockbolt is generally used in wing splice fittings, landing gear fittings, fuel cell fittings, longerons, beams, skin splice plates, and other major structural attachment. Often called huckbolts, lockbolts are manufactured by companies such as Cherry® Aerospace (Cherry® Lockbolt), Alcoa Fastening Systems (Hucktite® Lockbolt System), and SPS Technologies. Used primarily for heavily stressed structures that require higher shear and clamp-up values than can be obtained with rivets, the lockbolt and Hi-lok® are often used for similar applications. Lockbolts are made in various head styles, alloys, and finishes. The lockbolt requires a pneumatic hammer or pull gun for installation. Lockbolts have their own grip gauge and an installation tool is required for their installation. [Figure 7] When installed, the lockbolt is rigidly and permanently locked in place. Three types of lockbolts are commonly used: pull-type, stump-type, and blind-type. The pull-type lockbolt is mainly used in aircraft and primary and secondary structure. It is installed very rapidly and has approximately one-half the weight of equivalent AN steel bolts and nuts. 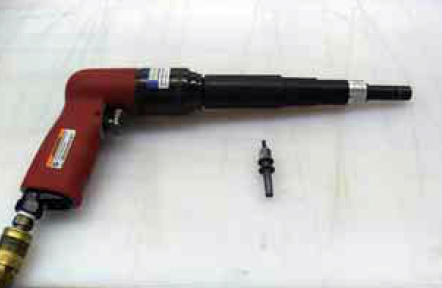 A special pneumatic pull gun is required for installation of this type lockbolt, which can be performed by one operator since buckling is not required. The stump-type lockbolt, although not having the extended stem with pull grooves, is a companion fastener to the pulltype lockbolt. It is used primarily where clearance does not permit effective installation of the pull-type lockbolt. It is driven with a standard pneumatic riveting hammer, with a hammer set attached for swaging the collar into the pin locking grooves, and a bucking bar. The blind-type lockbolt comes as a complete unit or assembly and has exceptional strength and sheet pull-together characteristics. Blind-type lockbolts are used where only one side of the work is accessible and generally where it is difficult to drive a conventional rivet. This type lockbolt is installed in a manner similar to the pull-type lockbolt. The pins of pull- and stump-type lockbolts are made of heat-treated alloy steel or high-strength aluminum alloy. Companion collars are made of aluminum alloy or mild steel. The blind-type lockbolt consists of a heat-treated alloy steel pin, blind sleeve, filler sleeve, mild steel collar, and carbon steel washer. These fasteners are used in shear and tension applications. The pull type is more common and can be installed by one person. The stump type requires a two person installation. An assembly tool is used to swage the collar onto the serrated grooves in the pin and break the stem flush to the top of the collar. The easiest way to differentiate between tension and shear pins is the number of locking groves. 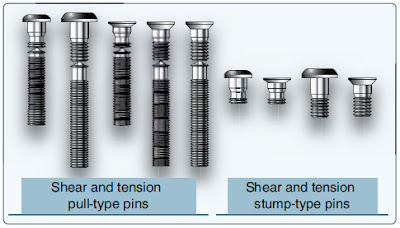 Tension pins normally have four locking grooves and shear pins have two locking grooves. The installation tooling preloads the pin while swaging the collar. The surplus end of the pin, called the pintail, is then fractured. The head must be firmly seated. The collar must be tight against the material and have the proper shape and size. Pin protrusion must be within limits. The best way to remove a lockbolt is to remove the collar and drive out the pin. The collar can be removed with a special collar cutter attached to a drill motor that mills off the collar without damaging the skin. If this is not possible, a collar splitter or small chisel can be used. Use a backup block on the opposite side to prevent elongation of the hole. The Eddie-Bolt® 2 looks similar to the Hi-Lok®, but has five flutes, equally spaced along a portion of the pin thread area. A companion threaded collar deforms into the flutes at a predetermined torque and locks the collar in place. The collar can be unscrewed using special tooling. This fastening system can be used in either clearance or interference-fit holes. 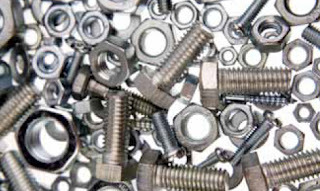 Bolts are threaded fasteners that support loads through predrilled holes. Hex, close-tolerance, and internal wrenching bolts are used in aircraft structural applications. Blind bolts have a higher strength than blind rivets and are used for joints that require high strength. Sometimes, these bolts can be direct replacements for the Hi-Lok® and lockbolt. Many of the new generation blind bolts are made from titanium and rated at 90 KSI shear strength, which is twice as much as most blind rivets. Determining the correct length of the fastener is critical to correct installation. The grip length of a bolt is the distance from the underhead bearing surface to the first thread. The grip is the total thickness of material joined by the bolt. Ideally, the grip length should be a few thousands of an inch less than the actual grip to avoid bottoming the nut. Special grip gauges are inserted in the hole to determine the length of the blind bolt to be used. Every blind bolt system has its own grip gauge and is not interchangeable with other blind bolt or rivet systems. Blind bolts are difficult to remove due to the hardness of the core bolt. A special removal kit is available from the manufacturer for removing each type of blind bolt. These kits make it easier to remove the blind bolt without damaging the hole and parent structure. Blind bolts are available in a pull type and a drive type. Several companies manufacture the pull-type of blind bolt fastening systems. They may differ in some design aspects, but in general they have a similar function. The pull-type uses the drive nut concept and is composed of a nut, sleeve, and a draw bolt. Frequently used blind bolt systems include but are not limited to the Cherry Maxibolt® Blind Bolt system and the HuckBolt® fasteners which includes the Ti-Matic® Blind Bolt and the Unimatic® Advanced Bolt (UAB) blind bolt systems. The Cherry Maxibolt® blind bolt, available in alloy steel and A-286 CRES materials, comes in four different nominal and oversized head styles. [Figure 10] One tool and pulling head installs all three diameters. The blind bolts create a larger blind side footprint and they provide excellent performance in thin sheet and nonmetallic applications. The flush breaking stem eliminates shaving while the extended grip range accommodates different application thicknesses. Cherry Maxibolts® are primarily used in structures where higher loads are required. The steel version is 112 KSI shear. 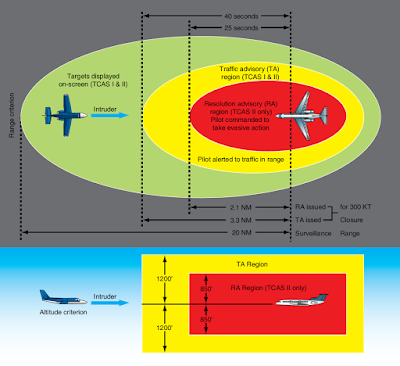 The A286 version is 95 KSI shear. The Cherry® G83, G84, or G704 installation tools are required for installation. The Huck Blind Bolt is a high strength vibration-resistant fastener. [Figure 11] These bolts have been used successfully in many critical areas, such as engine inlets and leading edge applications. All fasteners are installed with a combination of available hand, pneumatic, pneudraulic, or hydraulic pull-type tools (no threads) for ease of installation. Huck Blind Bolts can be installed on blind side angle surfaces up to 5° without loss of performance. The stem is mechanically locked to provide vibration-resistant FOD-free installations. The locking collar is forced into a conical pocket between stem and sleeve, creating high tensile capability. The lock collar fills the sleeve lock pocket to prevent leakage or corrosion pockets (crevice corrosion). Flush head blind bolts are designed to install with a flush stem break that often requires no trimming for aerodynamic surfaces. The Huck Blind Bolt is available in high-strength A286 CRES at 95KSI shear strength in 5⁄32-inch through 3⁄8-inch diameters in 100° flush tension and protruding head. Also available are shear flush heads in 3⁄16-inch diameter. A286 CRES Huck Blind Bolts are also available in 1⁄64-inch oversize diameters for repair applications. Jo-bolts, Visu-lok®, Composi-Lok®, OSI Bolt®, and Radial-Lok® fasteners use the drive nut concept and are composed of a nut, sleeve, and a draw bolt. 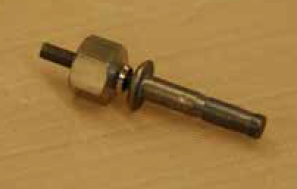 [Figure 12] These types of blind bolts are used for high strength applications in metals and composites when there is no access to the blind side. Available in steel and titanium alloys, they are installed with special tooling. Both powered and hand tooling is available. 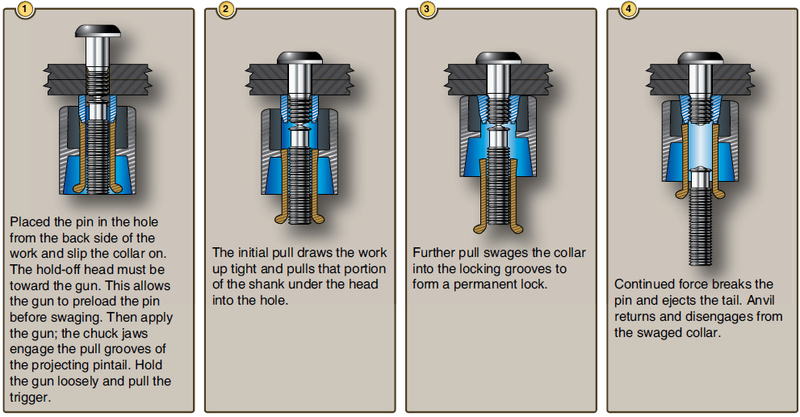 During installation, the nut is held stationary while the core bolt is rotated by the installation tooling. The rotation of the core bolt draws the sleeve into the installed position and continues to retain the sleeve for the life of the fastener. The bolt has left hand threads and driving flats on the threaded end. A break-off relief allows the driving portion of the bolt to break off when the sleeve is properly seated. These types of bolts are available in many different head styles, including protruding head, 100° flush head, 130° flush head, and hex head. Install the fastener into the hole, and place the installation tooling over the screw (stem) and nut. Apply torque to the screw with the installation tool while keeping the drive nut stationary. The screw continues to advance through the nut body causing the sleeve to be drawn up over the tapered nose of the nut. When the sleeve forms tightly against the blind side of the structure, the screw fractures in the break groove. The stem of Jo-bolts, Visu-lok®, and Composi-Lok® II fasteners does not break off flush with the head. A screw break-off shaver tool must be used if a flush installation is required. The stem of the newer Composi-Lok3® and OSI Bolt® break off flush. Tapered shank bolts, such as the Taper-Lok®, are lightweight, high strength shear or tension bolts. This bolt has a tapered shank designed to provide an interference fit upon installation. Tapered shank bolts can be identified by a round head (rather than a screwdriver slot or wrench flats) and a threaded shank. The Taper-Lok® is comprised of a tapered, conical-shank fastener, installed into a precision tapered hole. The use of tapered shank bolts is limited to special applications such as high stress areas of fuel tanks. It is important that a tapered bolt not be substituted for any other type of fastener in repairs. It is equally as important not to substitute any other type of fastener for a tapered bolt. Tapered shank bolts look similar to Hi-Lok® bolts after installation, but the tapered shank bolts do not have the hex recess at the threaded end of the bolt. Tapered shank bolts are installed in precision-reamed holes, with a controlled interference fit. The interference fit compresses the material around the hole that results in excellent load transfer, fatigue resistance, and sealing. The collar used with the tapered shank bolts has a captive washer, and no extra washers are required. New tapered shank bolt installation or rework of tapered shank bolt holes needs to be accomplished by trained personnel. Properly installed, these bolts become tightly wedged and do not turn while torque is applied to the nut. Sleeve bolts are used for similar purposes as tapered shank bolts, but are easier to install. Sleeve bolts, such as the two piece SLEEVbolt®, consist of a tapered shank bolt in an expandable sleeve. The sleeve is internally tapered and externally straight. 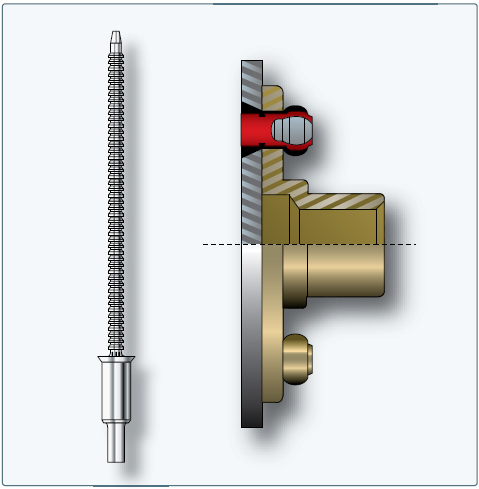 The sleeve bolt is installed in a standard tolerance straight hole. During installation, the bolt is forced into the sleeve. This action expands the sleeve which fills the hole. It is easier to drill a straight tolerance hole than it is to drill the tapered hole required for a tapered shank bolt. The rivet nut is a blind installed, internally threaded rivet invented in 1936 by the Goodrich Rubber Company for the purpose of attaching a rubber aircraft wing deicer extrusion to the leading edge of the wing. The original rivet nut is the Rivnut® currently manufactured by Bollhoff Rivnut Inc. The Rivnut® became widely used in the military and aerospace markets because of its many design and assembly advantages. Rivet nuts are used for the installation of fairings, trim, and lightly loaded fittings that must be installed after an assembly is completed. [Figure 14] Often used for parts that are removed frequently, the rivet nut is available in two types: countersunk or flat head. Installed by crimping from one side, the rivet nut provides a threaded hole into which machine screws can be installed. Where a flush fit is required, the countersink style can be used. Rivet nuts made of alloy steel are used when increased tensile and shear strength is required. Flat head rivet nuts require only the proper size of hole while flush installation can be made into either countersunk or dimpled skin. Metal thinner than the rivet nut head requires a dimple. The rivet nut size is selected according to the thickness of the parent material and the size of screw to be used. The part number identifies the type of rivet nut and the maximum grip length. Recommended hole sizes are shown in Figure 15. Correct installation requires good hole preparation, removal of burrs, and holding the sheets in contact while heading. Like any sheet metal fastener, a rivet nut should fit snugly into its hole. Common pull-type pop rivets, produced for non-aircraftrelated applications, are not approved for use on certificated aircraft structures or components. However, some homebuilt noncertificated aircraft use pull-type rivets for their structure. These types of rivets are typically made of aluminum and can be installed with hand tools. The new Cherry® Rivetless Nut Plate, which replaces standard riveted nutplates, features a retainer that does not require flaring. This proprietary design eliminates the need for two additional rivet holes, as well as reaming, counterboring, and countersinking steps.